This restaurant in Denmark, now called Whitney’s, sits beneath the city’s iconic water tower and next door to the beloved Jim Harrison Gallery. The restaurant opened in this building during the 1950s as the Denmark Tea Room; the Denmark Tea Room originated in the present-day Jim Harrison Gallery in 1894. 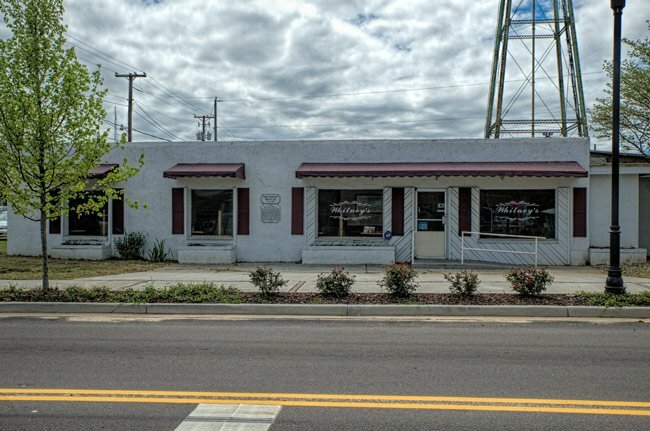 Soon after moving into this building, the Denmark Tea Room was transformed as the Edisto Drive-In, a car hop-style diner complete with an indoor jukebox and outdoor speakers. 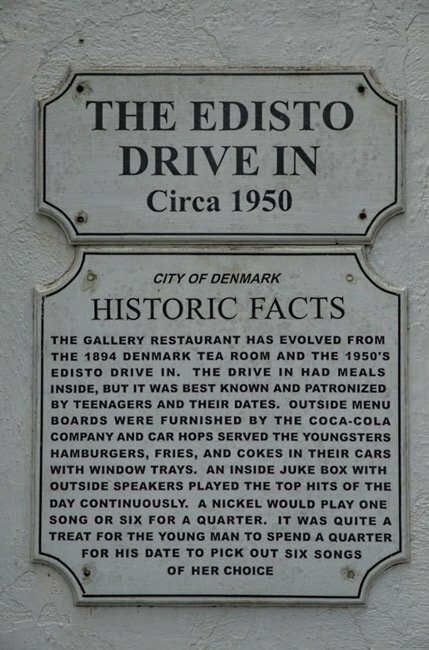 The Edisto Drive-In was a popular hangout for local teenagers in an era when a plate of fries and a nickel for the jukebox was all the entertainment anybody needed. As times changed, the building housed various other eateries, including the Denmark Diner and the Gallery Restaurant. The Gallery Restaurant is not to be confused with the Gallery Cafe, a seasonal tea room that operated on occasional Saturdays within the actual Jim Harrion Gallery. In 2015 Betty Odom-Bell opened Whitney’s in the restaurant building, naming it after her daughter, Whitney Odom, who manages the business. Whitney’s has garnered rave reviews since opening, providing locals and art lovers with a place to relax and dine after a day at the gallery.